The minimum age for this tour is 3. 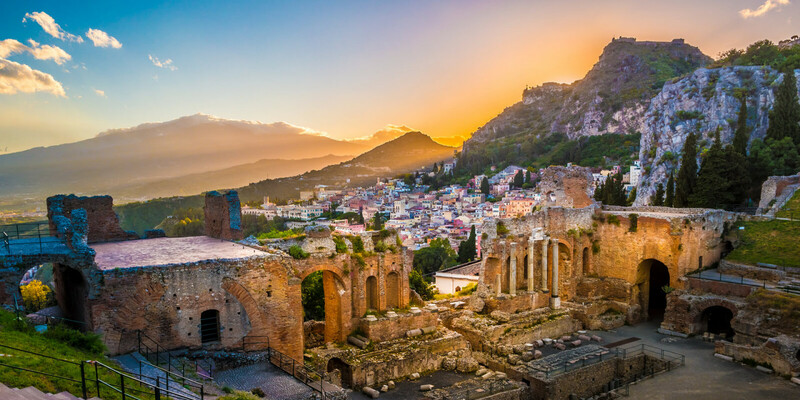 Along the main road in Taormina is Corso Umberto and both the Messina Gate and Catania Gate, plus popular monuments like the Palazzo Corvaja (Corvaja Palace), the Teatro Antico (Old Theater), Piazza IX Aprile, the Torre Dell'orologio (Clock Tower), the Cattedrale Fortezza (Fortress Cathedral), the Badia Vecchia (Old Abbey), the Palazzo Duca di Santo Stefano (Duke of Saint Stephen Palace), to name a few. 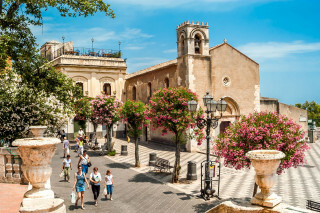 Pickup time for the Catania area is at 8:30-8:45 a.m.
Pickup time for the Acitrezza & Acicastello areas is at 9:00-9:15 a.m.
Total transfer time (pickup + drop-off) is about 1.5 hr. 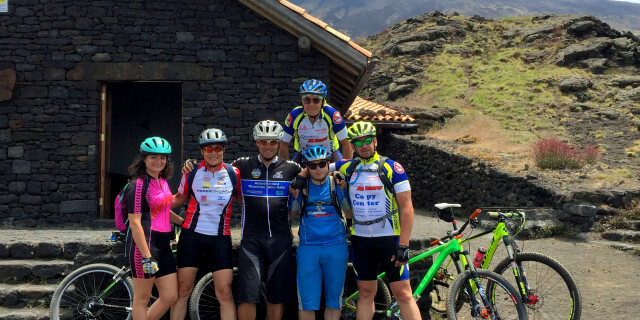 It takes about 1 hr to reach our high point at Etna from Catania. We spend 2.5-3 hrs in Etna, 20 min in the lava cave, 30 min on the farm, 2 hrs in Taormina and 1 hr on the road back to Catania. The cable car and cableway+minibus are purchased on the spot, with cash (euros) or credit card, on the day of the tour. What to bring: Windbreaker, tennis shoes, water, hat, and sunglasses. 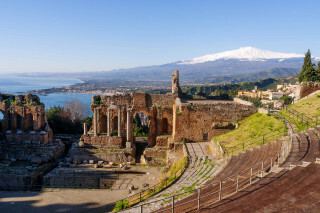 Mount Etna has been a force for 35,000 years. With great geological importance and active lava flows, exploring the volcano is unlike any other adventure. Its long history has made it a magical place, and this year-round tour guarantees you see every bit of the magic. We start our tour by picking you up from Catania and heading towards Rifugio Sapienza, a high mountain refuge standing at 1,935 m (6,348 ft) above sea level. Our first exploration is at the Monti Silvestri inactive craters, formed during the Mount Etna eruption of 1892. The next part of the tour provides two options. You can trek one of Parco dell'Etna's nature paths, which take you up to 2,000 m (6,562 ft). Or you can skip the trek and take a cable car, which gets you to a height of 2,504 m (8,215 ft) in only 15 min. From there, you hop on a 4x4 minibus and reach 2,900 m (9,514 ft) at Torre del Filosofo. From this height, panoramas surround you and the sea stretches below. 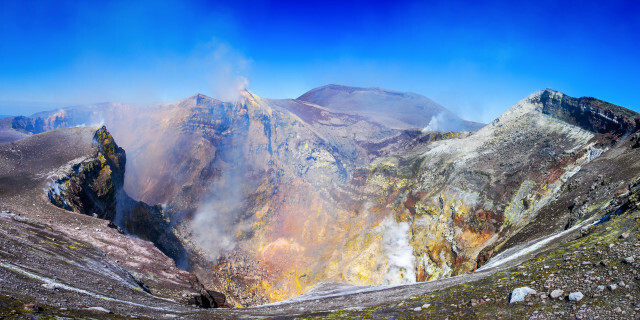 You explore the dominant central crater, the SE crater, and the lava flows characteristic of Etna's landscape while your guide safely leads you to areas where you can see the volcano's activity. Once back at Rifugio Sapienza, you receive your helmet and torch and explore a lava cave. 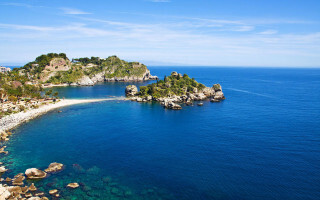 We then visit Zafferana, a charming coastal city that has been threatened by Etna many times. Our main stop is a famous organic farm, where we enjoy samplings of local honey, wine, oil, and more. Bellies full, we head to the small island of Isola Bella. Called the "Pearl of the Ionian Sea," this wildlife reserve's natural beauty is like a perfect postcard. The island is connected to the mainland via a thin strip of sand, and the surrounding water is crystal clear. If the weather permits, you are welcome to go for a swim! 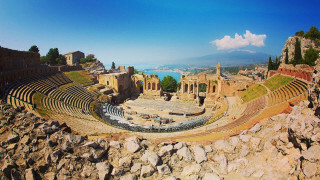 We finally reach Taormina and can grab some lunch on the way or in the city. You then have the afternoon free for exploring. Shop, discover, and see as much as your heart desires. There are countless popular monuments and areas around - the Corvaja Palace, the Fortress Cathedral, and more. We return you to your hotel at the end of our tour with a feeling that you truly did experience it all. It's a full-day tour in every sense!